We developed aptamers based biosensor for label-free detection of ochratoxin A (OTA) using thickness shear mode acoustic method (TSM). This method is sensitive to mass adsorbed at the sensor surface, measured by changes of resonant frequency, fs, and to the viscoelastic contribution, measured by motional resistance, Rm. Addition of OTA to a sensor surface with immobilised biotinylated DNA aptamers resulted in decrease of fs and increase of Rm. We were able to detect OTA with limit of detection of 30 nM and determined the equilibrium dissociation constant KD=43.9±30 nM. 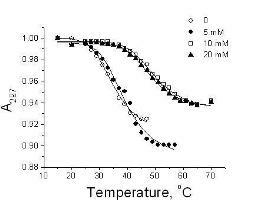 The OTA interacted with aptamer only in the presence of calcium ions. Therefore binding studies were performed in the presence of 20 mM Ca2+. No significant changes of fs and Rm were observed without calcium. We analyzed also changes of acoustic parameters in the presence of possible interference N-acetyl-L-phenylalanine (NAP). Addition of NAP in a concentration range 25-740 nM resulted similar frequency changes like that induced by OTA, however significant but much lower changes of motional resistance were observed only at the highest NAP concentration analyzed (740 nM).